Researchers led by scientists at Stanford University in U.S. and Beihang University in China have found that the mealworm can safely biodegrade various types of plastic. Americans discard about 33 million tons of plastic every year, less than 10 percent of which gets recycled. A solution to this problem may be the mealworm, which researchers in an ongoing study found can subsist on a diet of Styrofoam and other forms of polystyrene. The bacteria in the mealworm’s gut is able to biodegrade the plastic as part of its digestive process. Researchers found that 100 mealworms were able to eat between 34 and 39 milligrams of Styrofoam per day, which is about the weight of a small pill. 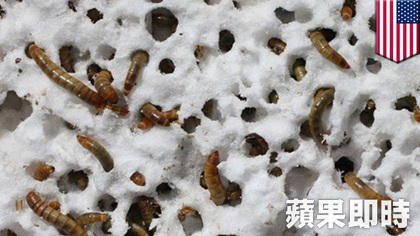 The worms converted about half of the Styrofoam into carbon dioxide, while they excreted the bulk of the remaining plastic as biodegraded fragments. Worms on the plastic diet remained healthy, and their droppings appeared to be safe for use as soil for crops. According to a Stanford University press release, the study is important because it contradicts the belief that Styrofoam is a non-biodegradable type of plastic.